For the village in Ryedale (also in North Yorkshire), see Acklam, Ryedale. 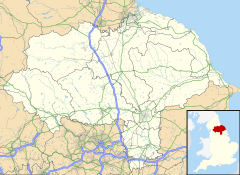 Acklam is a suburb of Middlesbrough, in the unitary authority of Middlesbrough, in north-east England and is associated with the county of North Yorkshire for ceremonial purposes. Acklam was referred to as "Aclun" in the 1086 Domesday Book. It is believed that the name is Anglo-Saxon Old English for "place at the oak clearings" or "place of oaks". In the late 19th and early 20th centuries, this once tiny village passed from Stokesley Rural District, to Middlesbrough Rural District and was eventually incorporated into the county borough of Middlesbrough during the early 20th century. In the west of Acklam is the abandoned medieval settlement of Stainsby, deserted by 1757. Today this amounts to little more than a series of grassy mounds near the A19 road. Acklam is situated in West Middlesbrough, and encloses smaller estates such as Kader, And Trimdon Avenue Estate. Acklam Road runs directly through Acklam, and just off Acklam Road is Hall Drive. The previous focus of the parish was the residence of the Hustler family, the Restoration mansion of Acklam Hall, this is shown in maps of the pre-industrial area—such as the 1714 Lordship of Acklam Plan—in the nearby Dorman Museum in Linthorpe. The house, formerly a grammar school and Middlesbrough's sole Grade I listed building, had ceased to be the Acklam Campus of Middlesbrough College by the middle of 2008. Acklam schools, include Kader Primary School, Acklam Grange School, Outwood Academy Acklam, Acklam Whin Primary School and St Clare's Primary School, on Trimdon Avenue. Acklam Grange Secondary School was previously Stainsby Secondary Modern School, named as such in 1952 after the mediaeval settlement of Stainsby. ^ "Area: Acklam (Ward)". Neighbourhood Statistics. Office for National. 1 January 2007. Retrieved 22 July 2015. ^ Matthews, A. D. (1987). Acklam Hall: A House and Its History. ISBN 0951234307. ^ "West Acklam Ch/CP/AP through time | Census tables with data for the Parish-level Unit". www.visionofbritain.org.uk. Retrieved 13 November 2017. ^ "Stainsby Medieval Village". Tees Archaeology. Archived from the original on 13 May 2012. Retrieved 20 December 2007. ^ Historic England. "Acklam Hall (Grade I) (1136868)". National Heritage List for England. Retrieved 13 November 2017. ^ "Acklam Hall in Middlesbrough reopens following renovation". ITV News. 18 February 2016. Retrieved 13 November 2017. ^ Smiles, Mieka (28 March 2017). "See inside Kirby College before its demolition". Gazette Live. Retrieved 13 November 2017. ^ "Mortimer's Teesside: Bob Mortimer lists his favourite places in our area". Gazette Live. 2 December 2014. Retrieved 27 December 2016. ^ "From card ace to TV stardom". gazettelive. 3 February 2003. Retrieved 4 June 2017. ^ Fletcher, Kevin (2011). Are You Affiliated?. Lulu. p. 128. ISBN 978-1-4466-8784-0. ^ Smiles, Mieka (27 October 2017). "What's it like to live in Acklam in 2017?". Gazette Live. Retrieved 13 November 2017. ^ Francis, Tony (1993). "1: Hey, Young Man". Clough; a biography (3 ed.). London: Stanley, Paul & Co. p. 9. ISBN 978-0-0919-4748-4. ^ "Liz Carling". Gazette Live. 27 April 2001. Retrieved 13 November 2017. ^ Webber, Chris (25 November 2014). "Teesside TV presenter Steph McGovern sent £20 to tone down Teesside accent". The Northern Echo. Retrieved 13 November 2017. ^ "Andy McDonald chosen as Middlesbrough Labour candidate in by-election to replace the late Sir Stuart Bell". Darlington and Stockton Times. 4 November 2012. Retrieved 30 November 2011. ^ Daniel, Brian (9 November 2012). "Berwick Parish Church vicar retires after 18 years tending flock". Journal Live. Retrieved 13 November 2017.